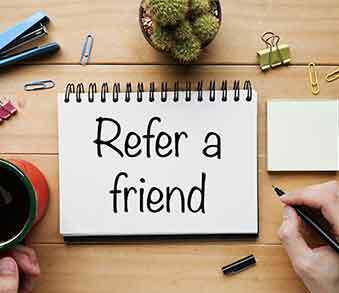 Earn a $25 account credit for each friend you refer to SWPL! You can use this simple form to send an invitation to your friends so they can benefit from the Southwest Power & Light's electricity savings – just like you. Besides, you know you can feel confident recommending a company that is committed to Great Rates and Customer Satisfaction...Guaranteed! Just type in your information and the email addresse for your friends and family. They will receive an email from you offering them the opportunity to enroll with Southwest Power & Light for any of our fixed rate plans. For each friend you refer that switches their electricity account to Southwest Power & Light, you will receive a $25 credit on your bill! That means if you refer 10 friends who enroll, that's $250 applied to your electricity bill! Please complete the form and click the Submit button when done.